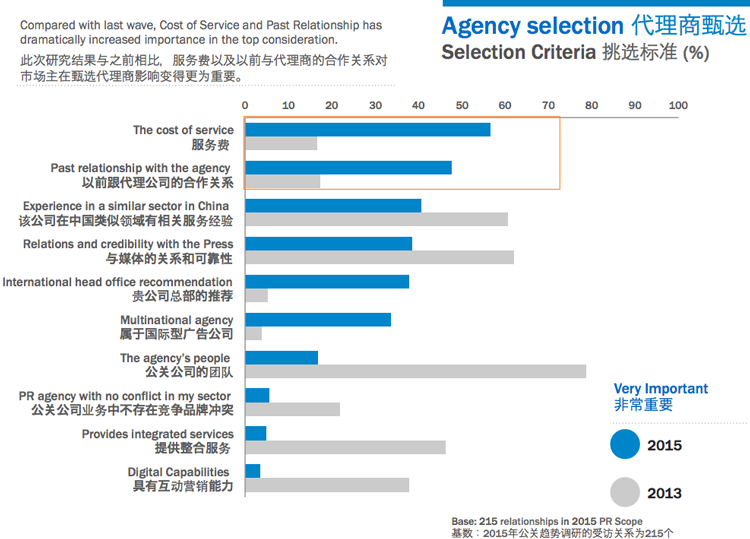 The slowdown in economic growth and rise in austerity measures across China are changing client/agency relationships, with price pressures playing an increasingly pivotal role in the selection process. 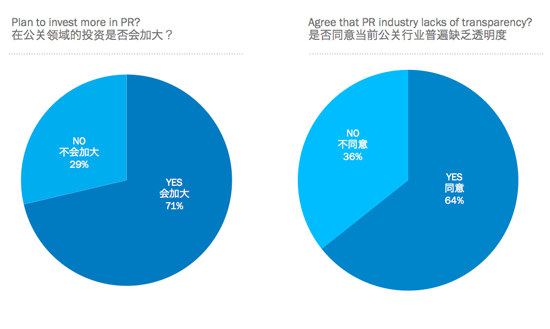 That’s the key finding of an in-depth survey of 150 marketers and corporate communications leaders across China conducted by consultants R3. The research covered 215 relationships across more than 60 agencies. "Fifty-seven percent of marketers now rate cost of service as a most important factor, up from 17 percent in our 2013 wave," said R3 managing director Sabrina Lee. 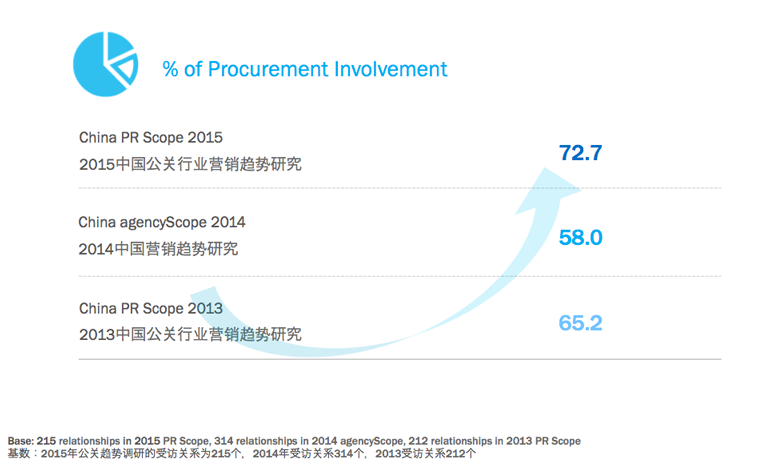 "From this result alone, we can see the new face and challenges of the PR industry in China." While cost considerations have soared in importance when selecting an agency, the assessment of the quality of its people has plummeted from being the top factor in 2013 to seventh today. The research also suggests that clients are increasingly open to new ideas, with fewer of those questioned expecting agencies to have experience in a similar sector. "Unfortunately, people quality has moved from being the number one factor on to number seven, but the demand for creativity has never been higher," said Lee. "Based on the key reasons to change agencies, a lack of creativity is now cited as the number one reason," she added. There has also been a notable rise in the number of companies changing agencies due to dissatisfaction over digital capabilities, up by more than 100 percent to 13.4 percent in the past two years. In contrast, the number of changes due to concerns over a lack of integrated capabilities or overall professionalism has decreased. Worries over the digital abilities in PR agencies are also evident from the fact that only 23 percent of marketers polled said they would use them as their lead digital partner. In 2011, 51 percent of those quizzed used a retainer fee model. Today that stands at 23 percent. The study also tracked the involvement of procurement in contract negotiations with PR agencies – with 72.5 percent of companies declaring they play a leading role, up from 65 percent in 2013. "The most progressive of PR agencies have understood the importance of procurement and have invested in commercial directors," said Lee. "It’s clearly a global trend for the industry and the entire procurement sector has matured a lot in five years," she added. When asked to name the companies best at public relations in China, tech giant Alibaba was most mentioned, followed by Coca-Cola. Others singled out for their PR approach included Xiaomi, BMW, Durex and Mercedes Benz. From an agency perspective, Ogilvy and Blue Focus ranked well in terms of positive perceptions, stated the report. It is likely that cost considerations will continue to play an increasingly important role in the next couple of years. While the Chinese economy is expected to grow by around 6.9 per cent this year, that figure stood at 10.4 percent in 2010. Analysts expect growth to dip again in 2016. However, that does not mean that marketers and brands will be cutting back on investment, with 71 percent stating they planned to spend more in PR. They would also like to see the industry become more open, with 64 percent calling for extra transparency (see graphic at top of article).